Willy Birgel was according to the wishes of his father educated as a goldsmith, but he also took acting lessons and started a carrer as an actor. In 1913 he married the actress Carola Cajetan and they had a son. During the First World War his career was interrupted. Between 1924 and 1934 he was engaged at the Nationaltheater in Mannheim. In 1934 he made his movie debut in "Ein Mann will nach Deutschland". He had parts in many movies during the nazi era and after the war he wasn't allowed to work for a certain period, but soon he was back and in 1950 he appeared next to Hans Albers in "Vom Teufel gejagt". In 1959 an old wish was fulfilled with an engagement at the Schauspielhaus in Zürich. In 1940 he had married another actress, Charlotte Michael. They had two children but a divorce followed in 1968. He died near Zürich in 1973. 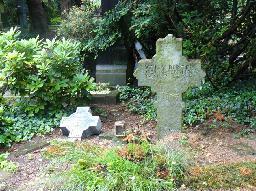 The grave of Willy Birgel at the Melaten Friedhof, Cologne.